These little tags are super easy and make adorable tie on’s to any gift. They would also be darling hung on a tree or garland. There are so many Paper Whimsy faces you can select to take center stage. Just print them out, glue and viola instant Christmas spirit. You are a veritable fountain of ideas this Holiday season! These are way cute! These tags are just darling and would be good for other times of the year as well, with just a few changes. You continue to be inspiring! 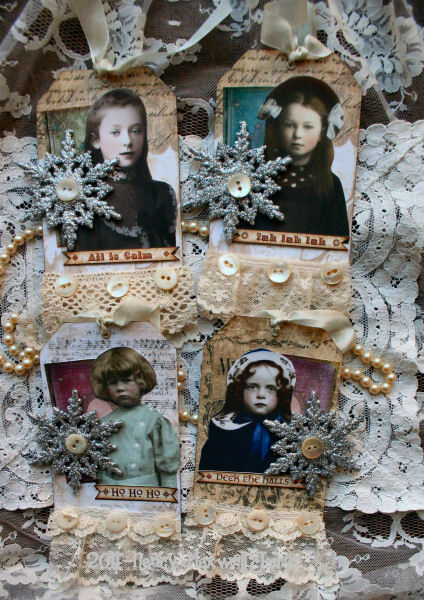 Nancy – these book tags are wonderful – I especially like the beautiful silver snowflakes – mixed with the lace. Gorgeous! So very beautiful,dear Nancy! Love them. I found some at Michael’s Craft store. They have several different sizes and colors. Tags are beautiful embellisments in many ways, but the lace and the sparkling snowflakes make these a real treat for Christmas. These are darling and can be used in so many ways. The embellishments are the perfect finishing touches. I had to laugh at the image you chose for the “Ho Ho Ho” tag. It was the absolute BEST! Terrific book tags, Nancy! Beautifully created! Thank you Nancy! I go crazy making tags, these are such an inspriation! These are the sweetest tags! I just love the vintage whimsy and the lace. These are so fabulous! I know if I can find the time, I’ll make these for friends. These are wonderful – so beautiful and rich-looking with the wonderful backgrounds and the vintage-style lace! Heading off to the studio to see what I can find to attempt a try at this loveliness! De.light.ful! Between yesterdays beautiful mittens and todays gorgeous tags you have put me in the mood to create! Everything you create is so beautiful and these are too. A special thank you for sharing all the how to’s as well. Oh Nancy, these are so adorable!! I just love the lace, and the snowflakes too. Nancy, the tags are beautiful! I have a few tags on my tree as we speak! FUN! Oh how I love looking at your blog each day, Nancy. The images, lace and snowflakes are so beautiful. These tags are so sweet. I love them. I can hardly wait to try them. You are always so inspiring! Lovely tags! These will be so much fun to make…I especially love the “pout” on your Ho Ho Ho…she should be saying “no, no, no”!!! lol!! Love the sparkle & the vintage-look. The girls look awesome on these tags! Every one of these is just vintage perfection! Love the “Ho Ho Ho”!! I love these and will be making some for sure. They are darling. Thank you! As you say, so many uses for those sweet tags. Love the way you added the text. as usual, you came through again! Darling!! J.T. Just found your blog and am blown away by the beautiful ornaments. What great ideas and the tutorials are so easy. Thanks for all your creativity. Your tags are very SWEET!!! Thanks for sharing!!! Love, love, love your tags (and everything else you do). These are absolutely charming, can’t wait to try something similar. Love, love, love!!! Everything you do Nancy, makes no difference. Thanks again for sharing how you do these beauties!! I hope to get some done……. Nancy these are just divine………… My work table is in creative overload with your wonderful tutorials. Thank You. These are so beautiful Nancy, thank you so much! these are stunning Nancy!!!! Thank you for so generously sharing your art and tutorials with us! 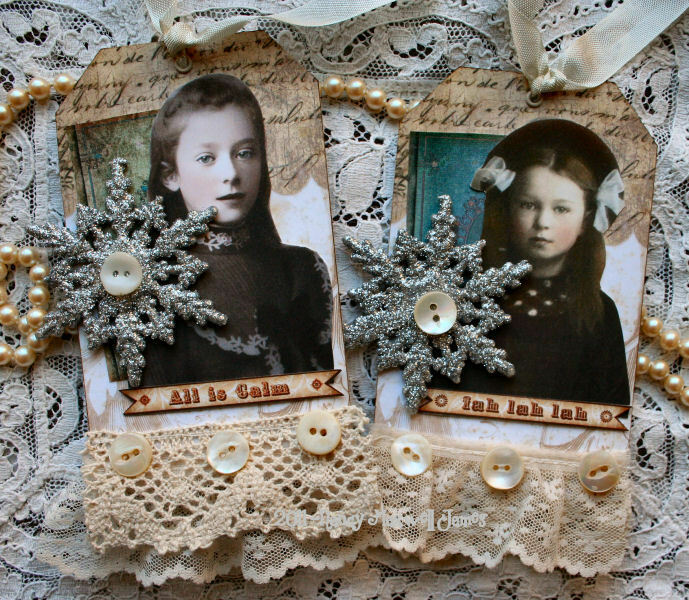 Great tags…and I’m thinking ATCs for the holidays! Love the way you put things together Nancy! These tags are so sweet Nancy! 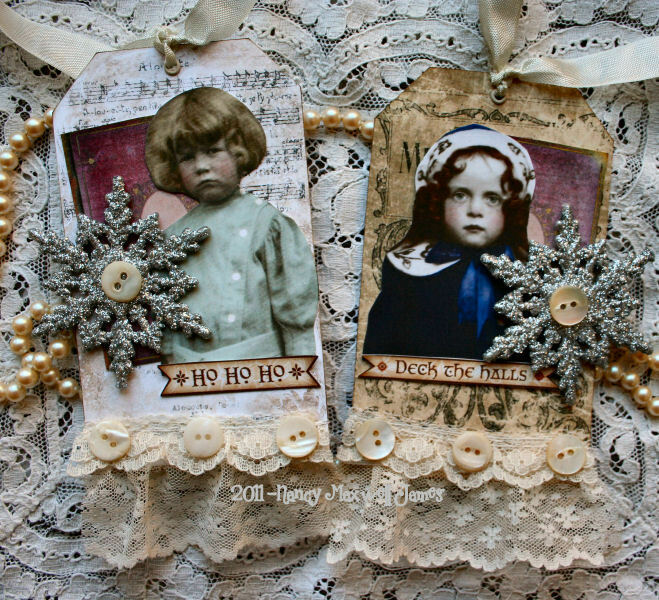 Luv your Vintage looking Christmas tags, what a wonderful project! your tags are beautiful! love your work! I found you through Terri! Your blog is beautiful! Just love your artwork and these pretty creative designs are just wonderful. Thank you for sharing. These make me want to go play in the studio! Love the digi sentiments. I love checking out your blog to see what new creation you have added! They are all so beautiful ! These little tags and bookmarks are delightful Nancy! So sweet! You must be feeling very festive Nancy. (and famous!) You have a gift of creating art that makes people feel nostalgic, humored, and sentimental. I appreciate that! Oh Nancy I have won. What a suprise for me. Thanks so much my friend. Your tags are just so beautiful–you are so amazing, Nancy–are you one of Santa’s elves in disguise??? These tags are so lovely, Nancy! Wonderful tags!!! I just love all the lace and buttons!!! Beautiful tags, Nancy! Love the design! Nancy your such an inspiration to us all. Gorgeous tags! I love tags and these are simply gorgeous! not on facebook but am a follower.